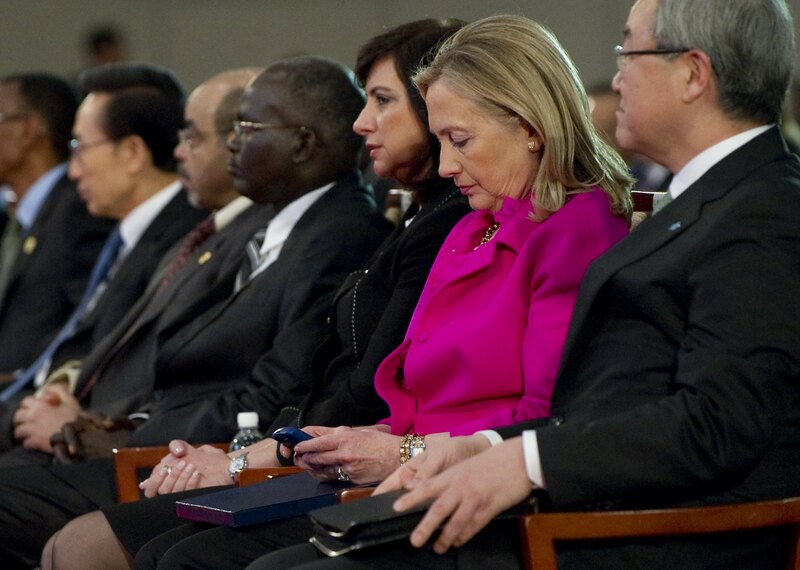 Now that Hillary Clinton has publicly stated she wants the State Department to release her private emails, everybody's clamoring to see what's in them. According to The New York Times, the State Department will review Hillary's emails, which total some 50,000 pages — and those are just the work-related ones. Sure, it'll be enlightening to see how the former secretary of state conducted our nation's foreign affairs (if only to see if she said things like "STFU already Putin"), but what we're even more curious about is all the non-work-related emails that will never see the light of day. On Monday, the Times revealed that Clinton never had a government email address and had solely used a private account for her correspondences while she was secretary of state, thereby circumventing federal policy to retain a record of officials' correspondence. It didn't take long for her opponents, most notably Jeb Bush, to criticize her stealthy move and for the public to speculate the damage it would do to her campaign. On Wednesday night, Clinton, being the classy lady that she is, owned up to the mishap and proved that she has nothing to hide by announcing that she wants the public to see them. "Knock yourself out — it's your overtime, not mine," she probably didn't say. But what is certain is that she's not about to let this email scandal get in the way of what America wants: Hillary for president. As the State Department begins to dive into the sea of correspondence, may I make a formal request that whenever you're done poring through the 50,000 pages that you also release some of the non-work-related ones? No rush or anything, but we'd like this to be done ASAP. In the meantime, here are eight exchanges we're hoping to see in Hillary's personal emails. We need to talk about the new curtains. They're God awful. Don't make authorizations for anything under the "decor" category if I'm on the road. We've been over this. Subject: Re: Do we like Jake Pavelka? No. How could you trust a man who uses a cell phone holster in 2010? Subject: Night out next weekend? Does Friday work for everyone? I've been dying to try The Gibson's Old Fashioned (thanks for the rec, Ruth). Plus, there's dollar oysters till 7 next door. Angie, I know it's a trek for you — want me to send the G6? Note to self: Get this for Bill's birthday. Honey, it's not going to pick itself up. We hope you and Michelle can make it! Does 2 p.m. work? Oh, and tell Michelle we'll have plenty of food. No need to bring her famous spinach cakes. TTYS. Subject: This is the last reminder. And you know what happens after that.